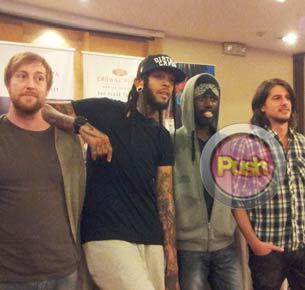 Travis McCoy of the American rap-rock band Gym Class Heroes talks about his love life and his musical influences. With hit songs like “Stereo Hearts,” “Cupid’s Chokehold” and the like, Gym Class Heroes’ vocalist Travis McCoy shared that their music is really inspired by how “boys and girls” deal with realities in life. But on a personal note, he admitted that he has never been lucky in love. “I’m a hopeless romantic, to be honest with you, and I think it shows a lot in the songs that I write.” At the same time, I’m envious about guys like Disashi (the band’s guitarist), who have been successful in holding down relationships with their girlfriends throughout this entire ride. I, unfortunately, wasn’t able to do that. But hopefully, I will one day. I have my dog and she’s very much committed to me,” he added with a laugh. If you recall, Travis pursued a solo career back in 2010, at the same time, released the hit single “Billionaire” featuring Bruno Mars. As for doing collaborations with other artists, he maintained that fame is not really a main consideration for him. “Being in the position to reach out to other artists that we look up to and admire, to ask them to be in a song with us is awesome. To find out that these artists are fans of what we do is kind of cool. We never reach out to other artists for the name's sake. It’s more of working with artists who can really bring the song to life,” he finally stated.